Longtime PowerPoint users, including this writer, remember fondly the days of version 2003. As old-fashioned as that version was — with its awkward slide layouts, unrefined visual aids, and often-bizarre object naming schemes — it had one quality that all subsequent versions lack: you could completely customize the interface. You could pick your favorite commands and your go-to functions and place them anywhere you wanted. You could identify them with text instead of unintelligible icons. And that version’s toolbars did not change as you worked, so once you placed your commands in certain places, they were guaranteed to always be in those places. In the name of “context sensitivity,” PowerPoint’s ribbons of commands are in a constant state of flux. Microsoft developers tried to anticipate which commands would be most useful in specific scenarios and made it so they appear in those scenarios. I don’t want to say that this was one big epic fail and that the development team did a poor job anticipating my usage of the program. I think the failure here is in the notion that anyone could anticipate another person’s habits and preferences. And yes, newer versions have a bit of customization built in, but it is clunky (you add entire groups of commands, not individual ones) and it does not address the issue of the moving targets that the ribbons have become. This little row of icons is the ultimate in customizability across the Office suite. It is also one of the least-utilized parts, if my clients are any indication: at least eight of every 10 client sites I visit display default QATs that have been untouched. That’s a gold-mine opportunity to improve efficiency and create economy of motion. The QAT is simply a group of commands, accessible at all times from a small row of icons that can sit above or below the Ribbon. In its default state, it’s a pathetic little thing, sporting icons for Save, Undo, Redo, and Start Slideshow. Veteran users know well the keystroke shortcuts for most of those commands, so it’s no wonder that the default QAT goes largely ignored. But here’s the thing: you can place any command on the QAT, including the ones that would otherwise require multiple clicks and lots of mousing around. Commands that never seem to be on the current ribbon when you want them. Commands that would take your focus away from your slide content. Commands that are so buried, you might not know they exist. Or commands that you don’t know exist because they were literally never placed on the interface at all! Smart use of this tool can make your time in PowerPoint more efficient and more enjoyable. For some, it’s enough to know that you can create this type of access to the commands that otherwise cost you lots of clicking and mousing. The next level, however, comes when you realize that the QAT can be accessed from your keyboard: press and release Alt and the entire interface lights up. You can reach any of the menus, and once you type the letter that corresponds to a menu, all of the commands on that ribbon display a letter. And every icon on the QAT is assigned a number or a letter! The ones past nine require that you type two characters after Alt, so they’re not quite as convenient. But the first nine are rock star: press Alt+1, for instance, and the first command is instantly invoked. In other words, you can create phenomenal shortcuts to nine commands — much better access than the older versions offered. So what should you put there? What are the nine things that are most deserving of killer access? What are your Nifty Nine? As you mentally survey the commands you use most often, I suggest resisting things like Save, Open, Print, and Start Slideshow. Those might be the four commands you use more often than any other, but they already have great access: Ctrl+S, Ctrl+O, Ctrl+P, and F5. Save the Nifty Nine for things that are not so easily reached. 1. The Animation Pane. That is my most-accessed task panes, and most of the time I want it, the Animations ribbon is not active. That would require that I click Animations, find Animation Pane, and then click it. Instead, I press Alt+1, which I can do without looking. 2. Format Shape. No matter what shape, object, or text box I have selected, I can begin formatting it by pressing Alt+2. 3. Crop. This might be the biggest timesaver of all because it allows me to use mouse and keyboard simultaneously. The conventional method of cropping photos would have me: a) double-click the photo, b) mouse up to the Ribbon to click Crop, and then c) mouse back down to the photo to begin the work. Instead, I select the photo, and with my mouse hovered in place, I press Alt+3 to immediately activate the tool. Dramatically less mousing! 4, 5, 6. Views. I regularly switch views during creation and my fingers now do that instinctively: Alt+4 for Slide Master, Alt+5, for Normal, and Alt+6 for Notes Page. 7. Align. Any time I need to align or distribute objects on a slide, I press Alt+7. I could have made this even more granular (i.e. press Alt+7 to instantly top-align a group of selected objects), I chose instead to create access to the drop-down that shows all choices. And the drop-down itself offers keyboard shortcuts (L for Left, C for center, etc. ), so this becomes easy muscle memory: Alt+7 | H to quickly distribute a group of objects horizontally. This is another instance where the keyboard and mouse can team up to work much, much faster than either could alone. 8. Arrange. All of the moving to the front and back, grouping and ungrouping, aligning, and rotating — all on one drop-down that appears with Alt+8. The ninth position is shared between the Paragraph dialog, Paste Special, Add Bookmark, and Insert Picture. I tend to use those commands in bunches at specific times in the workflow of a project, so I shuttle them from their homes in positions 10-13 into 9 as needed. If I were a VBA developer, I could write a script that, say, creates a rectangle, fills it with Accent 1, adds a soft shadow, and applies a one-second Fade In, set After Previous. And then I could place that on the QAT, as its engine supports the placement of user-created macros. And the positions past the Nifty Nine are completely viable — even though it’s one extra keystroke, pressing Alt+09 beats the stuffing out of Insert | Audio | Audio from my PC when you want to insert a sound clip. This isn’t just about being faster, although you unquestionably are when you place commands on the QAT. In our digital age, the risk of repetitive-stress injuries is high and tasks can become mind-numbingly tedious. Smart use of the QAT can contribute to better physical and mental health. So what’s on your QAT? Share your faves and make everyone’s lives easier. Close File is a very swift Ctrl+W and my fingers go there instinctively. But Open Recent — that’s a terrific suggestion, especially now that Office apps want to look in the cloud first. Thanks for sharing that, JB. Do miss the custom toolbars from the old days… but the QAT beats a blank. I always carry my toolbar on a flash drive too so that any laptop can have my settings. AND I love learning new stuff… thanks for the tip on superscript nudging! Never even knew that existed. 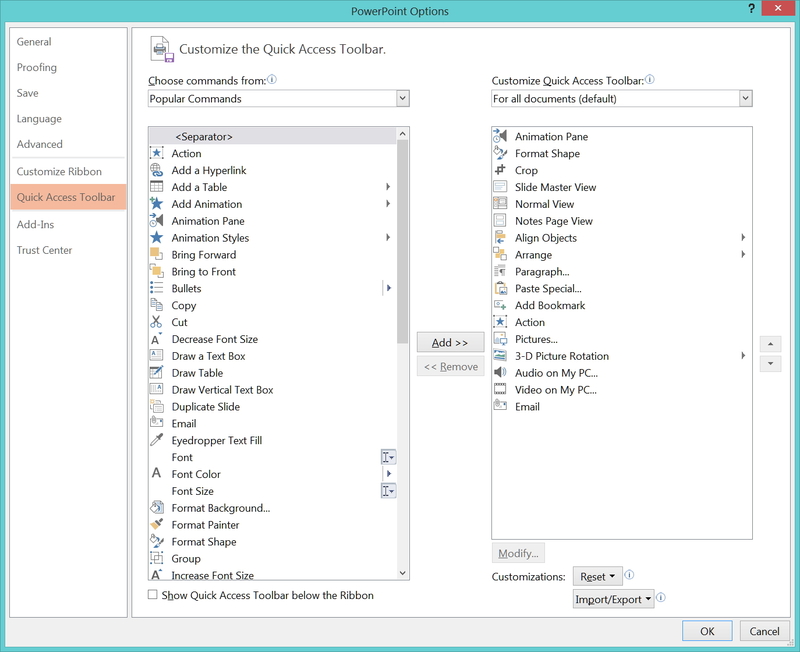 Thanks for your recent article on customizing the QAT with keyboard shortcuts. Iâ€™ve used the QAT for years, but never connected it to the ALT-1, ALT-2, etc. shortcuts that you describe. How do you connect these keyboard shortcuts to various commands? It seems to be in this Customize Ribbon interface (attached), but from there it gets really confusing. Oh… thanks, Rick. It didn’t cross my mind that it would be that easy! Thanks so much for this, Rick. I use a lot of keyboard shortcuts and am always looking for ways reduce clicks even more. One thing that would help a lot would be being able to change animation effect option defaults. For example, I generally want to wipe text from the left, but the default is from the bottom. Any way to put that specific command (“wipe from bottom”) on the QAT? I wish, Debby! My preferred animation settings are nothing like the default and it infuriates me that I can’t change them. This could be accomplished with a VBA script, and the script could be attached to the QAT. So it is quite doable, you might need a bit of help from a geek friend to develop the script.